MAGNETAWAN – The Magnetawan hatchery is swimming on another day. In an apparent about face, the Ministry of Natural Resources and Forestry offered an agreement to the Almaguin Fish Improvement Association that lets the walleye-stocking operation operate for another year, until March 21, 2016. 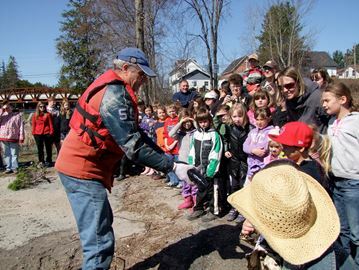 “I think Magnetawan’s name should be changed to the community that cares,” association president Doug Lidstone says. The association has been stocking walleye in Ahmic and Cecebe lakes for the better part of the past 35 years. MNRF cancelled the hatchery last month, citing possible harm to the fish population’s genetics. Both community members and local government rallied together to show support for the fish stocking operation. Many municipalities passed resolutions supporting the program, locals signed a petition being circulated by the association, and Parry Sound-Muskoka MPP Norm Miller questioned MNRF’s decision at Queen’s Park on multiple occasions. On Friday, April 10, the ministry requested a meeting at its Parry Sound office with the association and Miller. Neither local party was optimistic going in — in fact, Miller was already drafting a question to MNRF minister Bill Mauro for Monday about the issue — but their skepticism quickly turned to joy as the ministry handed them an agreement to keep the hatchery running for another year, and with less ministry supervision than previously.